The 3-star Hotel Penelope has a bar, living room, dining room, breakfast veranda, exterior swimming Pool with pool bar, private parking, garden, sun beds, library, free access to the Internet everywhere, free fax services, car-scooters-boat rental (on request), and daily maid service. The hotel is just 60 meters away from the sea and Boukari harbour.this family run businness is open again from the end of March util the end of October. The 12 double rooms and 4 studios are constantly renovated to ensure the highest levels of comfort. 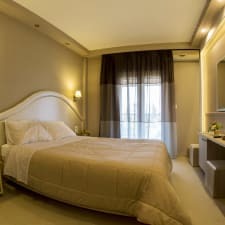 The double rooms have double or twin beds, air conditioning, satellite TV, fridge, safe, hair dryer, bathroom and balconies with sea and garden views. In addition the studios all have double beds and a kitchenette. The small sandy beach with crystal clear water and the famous fish-tavernas in Boukari are nearby.